Manaphy falls asleep in Haruka’s arms shortly after hatching. Pokemon Ranger and the Temple of the Sea, known in Japan as 「ポケモンレンジャーと蒼海の王子 マナフィ」(lit. “Pokemon Ranger and the Prince of the Sea: Manaphy”) premiered in Japanese theaters on July 15, 2006 and on Cartoon Network in the United States on March 23, 2007. This is the final film in the Advanced Generation series of movies and by extension marks the final time we will see Satoshi (Ash Ketchum) and Takeshi (Brock) accompanied by Haruka (May) and her little brother Masato (Max). How will this film conclude the Advanced Generation saga? Let’s take a look! The film starts with a prologue to the main story. A mysterious blue egg is floating through the ocean, carried along by the currents and by schools of marine Pokemon. Suddenly, light shines down on the egg from search helicopters flying above and a large submarine begins to approach the egg. The helicopters and the submarine are commanded by a Captain Phantom, a notorious pirate, and his crew. He’s been searching for the egg of a marine Pokemon known as Manaphy for a long time, knowing that it would lead him to a great treasure. After securing the egg and bringing it inside of his submarine with a robotic arm, Phantom takes a moment to gaze upon it in wonder. Before he can grasp it in his hands, one of his ship hands snatches the egg away and begins to make a break for it. This person, Jack Walker, is a Pokemon Ranger and was working under Phantom’s command as an undercover agent. As a Pokemon Ranger, Jack’s duty is to protect the environment and Pokemon from ne’er-do-wells. Jack manages to escape from Phantom’s sub, taking with him Manaphy’s egg. Once this prologue concludes, the film then follows Satoshi (Ash Ketchum), Takeshi (Brock), Haruka (May), and her little brother Masato (Max) travelling on a very hot day. The four of them are parched and have no more water in their canteens. Thankfully, they find the world-famous Marina Troupe practicing their act nearby. The Marina Troupe is a family of performers whose performances are unique water shows that involve both water and psychic-type Pokemon to suspend large bubbles of water in mid-air. Satoshi and friends hitch a ride with them as they head towards a nearby city where the Marina Troupe is performing. As they all leave the city, the troupe’s caravan is attacked by Phantom. The troupe, it turns out, is in possession of the Manaphy egg and is sheltering Jack Walker, who is acting as one of their performers. They manage to fend off Phantom’s attack and escape in the family’s RV. During the escape, the Manaphy egg hatches in Haruka’s arms. Because she was the first thing it saw upon birth, it imprinted Haruka as its mother. Jack reveals that he is cooperating with this family because they descendants of an ancient tribe called the “People of the Water.” In the distant past, the People of the Water revered the ocean and also had access to strange technology powered by what can only be described as magic. Long ago, they constructed an underwater structure called the Sea Temple in which all Manaphy grew to live in. All Manaphy, despite how far they travel from it, instinctively know how to return to the Sea Temple which cannot normally be found as it travels with the ocean currents and is concealed with some form of cloaking. Phantom was searching for Manaphy so that he may find the Sea Temple and take all of its treasures. Satoshi, Jack, and the rest of the family begin a journey by boat to find the Sea Temple before Phantom does. 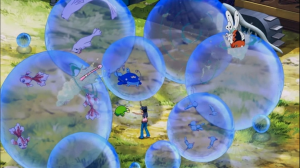 At first, thinking of the dangers, Jack and the family left Satoshi and his friends behind, but Manaphy’s attachment to Haruka prevented them from doing so peacefully. Along the journey, Haruka begins to grow more and more attached to Manaphy. Jack, understanding that Manaphy will have to part ways with Haruka once they reach the Sea Temple, tries to convince her to maintain distance so that the parting will be as painless as possible. 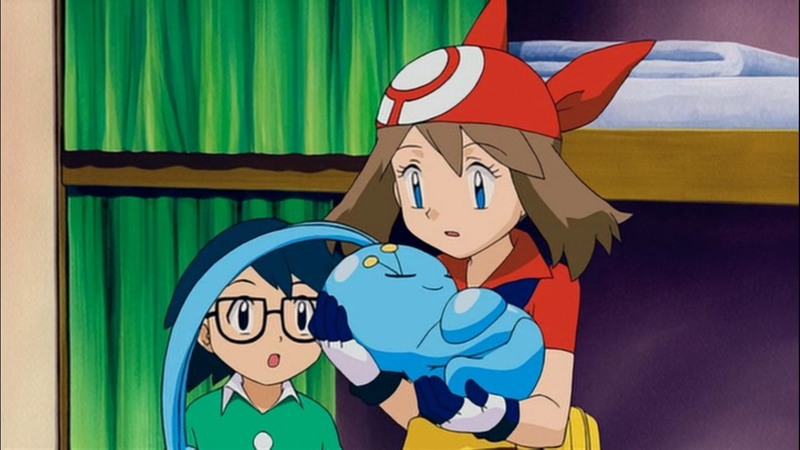 However, Haruka concludes that she just can’t do that and so she decides to continue to shower Manaphy with affection, despite the pain it may cause later. Finally, they reach the location of the Sea Temple and using a submersible vehicle, they enter the temple guided by Manaphy. Inside, they find beautiful architecture and a haven for marine Pokemon. Their tour of the temple is interrupted when Phantom and his men make an appearance. This whole time, Phantom and his crew were trailing the group’s boat deep below the ocean in their submarine and followed them into the Sea Temple. At the center of the temple, Satoshi’s group and Phantom find the great treasure that Phantom has been searching for, the Sea Crown. Though called a crown, the treasure itself is not a piece of jewelry, but rather a stone pedestal engine of sorts that hold crystals containing tremendous energy within them. Phantom begins to remove the crystals one by one from the Sea Crown until Jack finally reaches the group to help them stop Phantom. By this point however, it was too late. Due to Phantom’s meddling, the Sea Temple was beginning to lose its power to stay buoyant and maintain the barrier that separates it from the surrounding sea. The temple started to flood from the moment Phantom removed the crystals, and the fighting between Phantom and Jack only allowed more water to gather. With not much time before the temple sinks, Phantom, Jack, and the rest of the crew decide to abandon it and get to safety. However, Satoshi and Haruka, realizing that Manaphy wasn’t with them, rush back into the sinking temple to look for it. There, they find Manaphy struggling in vain to place the crystals back into the Sea Crown to restore the temple’s functions. Satoshi and Haruka manage to place all the ones that Phantom left behind back into the crown, but realize that one that knocked out of Phantom’s hand during his fight with Jack floated off . Satoshi, after securing Haruka and Manaphy inside of a life vessel left behind by Phantom’s personal submersible, searches throughout the whole temple looking for the last crystal. Eventually, he manages to find it, but by this time, the temple was almost completely submerged and he would have to dive down a great depth to reach the crown. 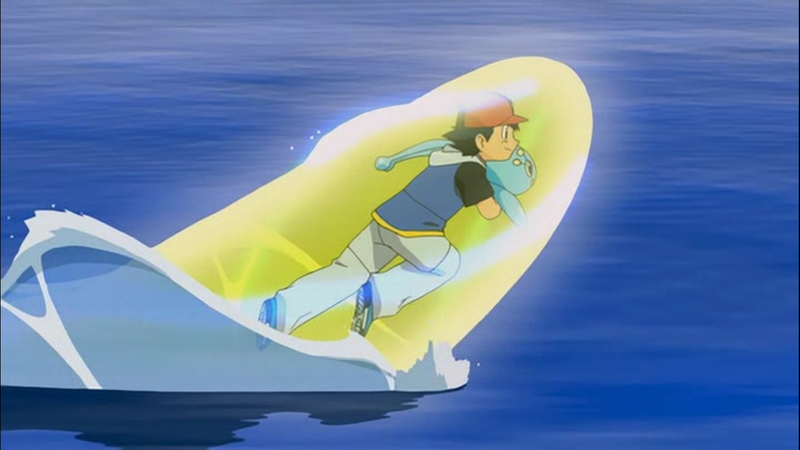 Despite the threat of drowning, Satoshi dives all the way and successfully replaces the final crystal. Thinking himself a goner, he gives up trying to swim to the surface for air, when a mysterious light begins to envelop him. As everyone resurfaces, the restored Sea Temple restarts its engine and floats back up to the surface to purge itself of water. Phantom, realizing that he failed this time, makes one last-ditch effort to kidnap Manaphy from Haruka. He manages to grab Manaphy from her grasp and tries to make way back to his submarine. Suddenly, from the temple, Satoshi begins to fly through the air enveloped in the aforementioned mysterious light. Given the power of flight and the ability to effortlessly glide through the ocean, Satoshi chases down Phantom and secures Manaphy once more. 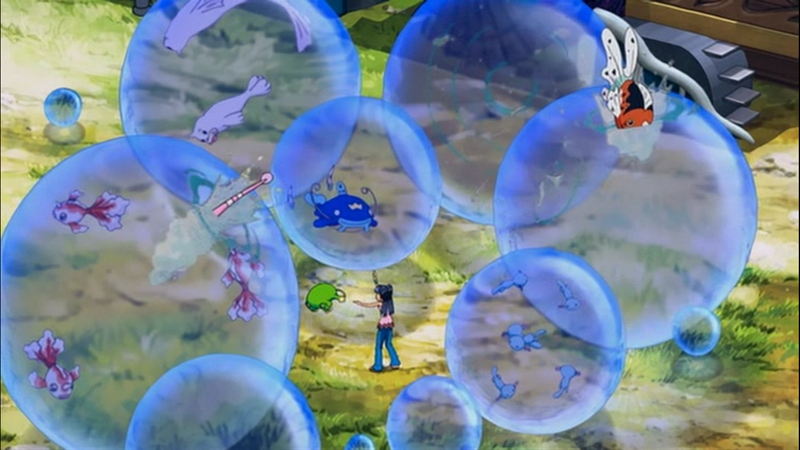 Manaphy, crying out to the other marine Pokemon, organizes a simultaneous attack on Phantom’s submarine. The Pokemon effortlessly destroy it aided by the legendary Pokemon Kyogre who happened to be swimming nearby. At the end of the film, the light that surrounded Satoshi surrounds the rest of the group as well as the Marina Troupe and they all have a grand old time swimming together with the Pokemon. At the end of the film, the Sea Temple begins to return back into the ocean and Manaphy must go along with it. Haruka and Manaphy say their sad goodbyes and the film concludes. As some of you may have already noted, the general themes and story of Pokemon Ranger and the Prince of the Sea – Manaphy (hereby Manaphy because that’s a freaking mouthful) mirror those in Jirachi – Wishing Star of the Seven Nights perfectly, notably in that both feature one of the two siblings (Masato and Haruka) bonding together with the titular Pokemon. From a symbolic perspective, this is freaking cool. Bookending this arc of films as such shows that the writers are paying attention to the Advanced Generation sub-series as a whole rather than looking at each movie in isolation. It’s one of those “the circle is now completed” moments. Jack and Phantom confront inside of the Sea Temple. Note just how carefree Jack is about the whole shebang. To get to the actual contents of the film, here’s something to note. Just like on our Earth proper, much of the world of Pokemon is covered in water. Naturally, a lot of Pokemon live in the sea. Despite this, Manaphy was the first Pokemon film to really explore the world of marine Pokemon in any real depth (see what I did there?). We’ve had in the past Revelation Lugia and Latias and Latios – The Guardians of Alto Mare take place in water-centric locales, but never before do we actually explore underneath the surface of the sea. So, what kind of villain is fitting for an ocean voyage? What better than pirates? The Marina Troupe Pokemon hard at work preparing for their show. The Water-type Pokemon do the acrobatics while the Psychic-types suspend the water. 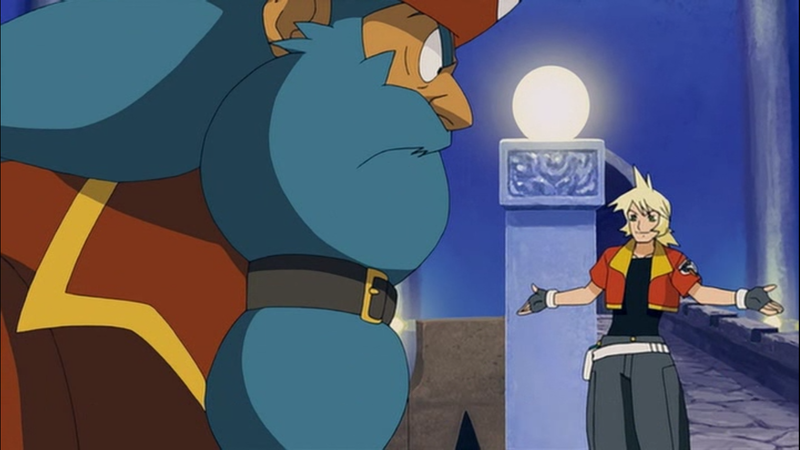 Like in the previous film, Mew and the Wave Hero – Lucario, there is something of two stories working at the same time. One of the things I criticized Lucario for was how ill-fitting the stories worked in tandem. I didn’t sense that at all in Manaphy. The sub-story involving Phantom and Pokemon Ranger Jack Walker and the main story involving Satoshi and his friends meshed together very nicely. I thought it was rather cool that Jack and Phantom were shameless analogues of Peter Pan and Captain Hook respectively. It was a battle of the nimble youth versus the heavy footed, vinegar-filled swashbuckler. The inclusion of the Marina Troupe family even was a great addition, if for nothing else other than the novelty of their travelling Pokemon show. It shows just how creative the animators can get with showing off the potential of Pokemon. Satoshi managed to save Manaphy from Phantom’s grasp using some ancient magic that lets him pretend like he’s Superman. In reality though, I think the writers straight up ran out of time in the movie to do anything smarter. Ever since Mewtwo Strikes Back, each Pokemon film has successively tried to push the boundaries of time. Mewtwo was roughly 75 minutes in length. Lucario and Manaphy push at the 1 hour 45 minute mark each. In Manaphy’s case, it almost feels like the writers wanted the movie to be longer than even that. When it came time to cut scenes to keep it less than 2 hours, it feels as if the director cut poorly, leaving in a lot of scenes lacking in action and movement and focusing less on the pivotal parts such as a proper climax and a conclusion. It’s kind of funny actually how well Jirachi and Manaphy foil together. Jirachi had a weak start and a grand conclusion, while Manaphy had the exact opposite with a strong start, but sputtering conclusion. I’m sure that wasn’t what the directors had envisioned, but that’s ultimately what they got. Thus ends the Advanced Generation series of movies folks. Next up is the Diamond and Pearl arc of movies. What kind of theme will they stick to for this next one I wonder? Join me next week!